The highest rated sports franchise over the last 8 years is back and better than ever. Welcome to The Show. highest rated sports franchise over the last 8 years* is back with new ways to play, morerealistic gameplay physics and the most authentic MLB gaming experience ever. 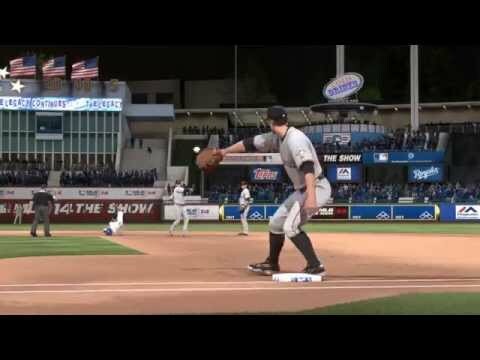 From the booth to the field, MLB 14 The Show captures the most exciting moments in baseball. Welcome to The Show. Major League Baseball and Minor League Baseball trademarks and copyrights are used with permission of Major League Baseball Properties, Inc., and MLB Advanced Media, L.P., as applicable. Visit MLB.com and MiLB.com. © MLBPA-Official Licensee, Major League Baseball Players Association. Visit www.MLBPLAYERS.com, the Players Choice on the web. The Baseball Hall of Fame and Museum trademarks and copyrights are used with permission of the National Baseball Hall of Fame and Museum, Inc., as applicable. Visit the official website of the Hall of Fame at BaseballHall.org. © 2013 Sony Computer Entertainment America LLC. Blu-ray Disc™, Blu-ray™, and the logos are trademarks of the Blu-ray Disc Association. The Sony Computer Entertainment logo is a registered trademark of Sony Corporation. “PlayStation”, the “PS” Family logo and “DUALSHOCK” are registered trademarks and “PS3” and “PS4” are trademarks of Sony Computer Entertainment Inc.